Garmon Corp. has been manufacturing preventative and solution-based supplements for dogs, cats, and horses for over 25 years! As a leading contract manufacturer, we strive to provide excellence in global regulatory compliance and quality management. Our Quality Assurance, Quality Control, and Regulatory Compliance teams help to ensure that our people, practices, facilities, ingredients, and components all meet or exceed the standards mandated by industry regulations, providing the highest quality products available. We are capable of manufacturing pet supplements in the form of soft chews, liquids, powders, and tablets with at variety of packaging options available. Our state-of-the-art manufacturing facilities are located in Temecula, California. Our combined facilities encompass approximately 105,000 square feet of production, analytical laboratory, pilot laboratory, and warehousing space. We continually strive to achieve better efficiencies to meet the growing demand for pet supplements, and are constantly upgrading and modernizing our facilities. 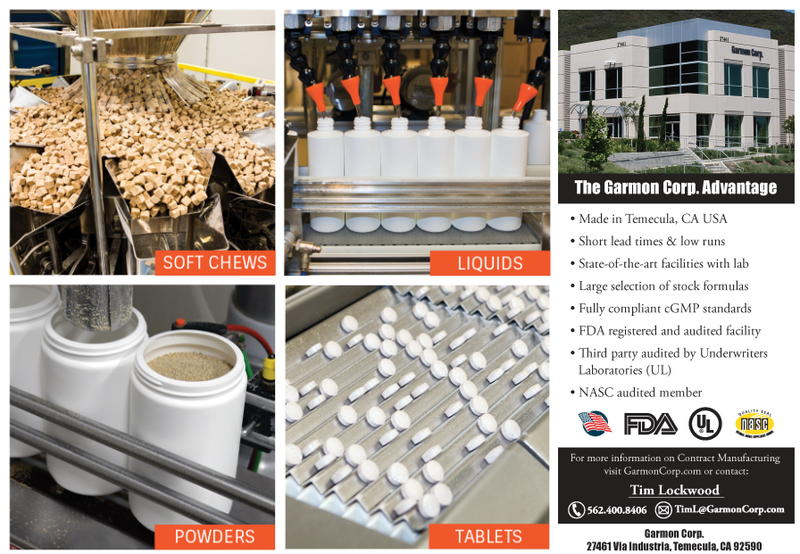 Garmon Corp. is a fully complaint cGMP standards facility, following the highest industry standards. We are an NASC Audited Primary Supplier, and FDA registered and audited facility, as well as third-party audited by UL Labs. For more info, visit our website or contact us.